He was a hell of a player ! one of my favourite ever ! Right now he is doing magnificent job at the red bulls. wow, love him. such an amazing talent, shame we can't clone players like him. Lothar Matthäus won the Bundesliga six times with FC Bayern München. bundesliga.de asked him to take a close look at 2007’s FCB. Question: Is the current team the best FC Bayern ever? Lothar Matthäus: You can’t compare today’s football to the football that was played when Bayern had the great team around Franz Beckenbauer. But it’s definitely great fun to watch FC Bayern. At FC Bayern the team is always better than the year before, in every season. Q: Are the signings of Franck Ribery, Luca Toni and Miroslav Klose the only reasons for the upturn? Matthäus: Bayern have learned from last season. They rested on the success of the previous years for too long. But it was an eye opener for the people responsible. It was a good thing to draw a line and to invest. That benefits not only FC Bayern, but the Bundesliga, too. And not only because of the results. The way they play football makes them popular with fans of other teams, too. That’s why the cut was very positive for FC Bayern, not only sportingly but also for the image. Q: Do you see a team that could be dangerous for FC Bayern this season? Matthäus: Bayern can only beat themselves this season, especially in the league. You can always have a bad day in the cup and be eliminated, but they won’t get beaten in the league. They have the best team and have started the season outstandingly. The rivals have already dropped points. Defending champions VfB are already 13 points behind Bayern. Q: What makes Bayern so strong, compared to last season? Matthäus: They act as a team again, play refreshing football and have fun. That’s the most important thing, to not only see football as a profession. Ribery for example is a real joker, be it in training or on travels. 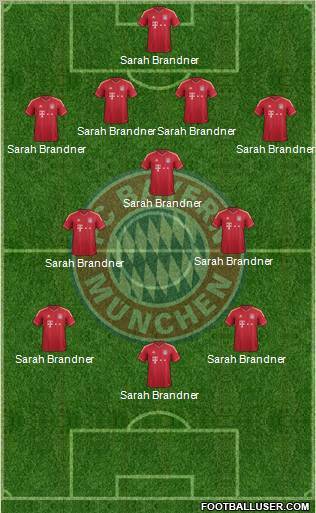 At the moment everything fits at FC Bayern. Q: Could Karlsruher SC be a threat for Bayern? Matthäus: No, KSC are not strong enough to stay at the top. But I didn’t rate them as relegation candidates before the season. They will end up in midfield, everything else would be a surprise. They’re on a run at the moment and live on euphoria. And they’ve strengthened very well with minor financial funds. lol how many wives has he had so far? Lothar Matthäus already has a new girlfriend and he says he wants to be a father again. He also revealed that he would like to win the Bundesliga as a coach and said "preferably with Bayern"